Dianne Collins is an original thinker, media personality, and one of the foremost thought-leaders of our time. She is a master of translating ancient knowledge into “quantum” modern wisdom that provides a transformative platform for the way we conduct our business and personal affairs. Dianne is the creator and author of QuantumThink, a new system of thinking that has us leap from the outdated “old world view” limits of the Industrial Age to begin thinking from the more accurate and up-to-date “new world view” of our current Quantum Age. Along with her husband and business partner, she consults visionary leaders and executives in the world’s leading corporations including Accenture, AT&T, CNN and Dupont as well as presenting QuantumThink to entrepreneurs and students, homemakers and professionals, celebrities and evolutionaries worldwide. Click here to take a look inside. Dianne Collins – Do You Quantum Think? Author Dianne Collins discusses her book Do You Quantum Think? and how important it is to reshape the way we think so it aligns with nature and with modern times. It’s great advice that can be easily applied to the process of writing and publishing a book. Everyone knows we need to think in a new way–so what really is “new thinking”? Dianne Collins gives us a QuantumThink perspective in this 17-minute video (in 2 parts) that was presented to business leaders in CNN International. The author of Do You QuantumThink? 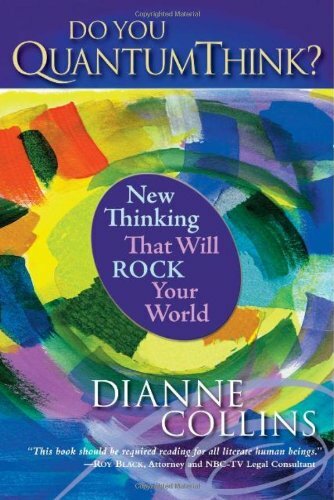 New Thinking That Will Rock Your World discusses the reason our thinking has been limited and how we can free ourselves from outdated ways of thinking toward real solutions that will work now in our changing world – for ourselves personally, professionally, and globally. This is worth thinking about : ) NOTE: The video takes about 15 seconds to begin. Everyone knows we need to think in a new way–so what really is “new thinking”? (Part 2 of 2) Dianne Collins gives us a QuantumThink perspective in this 17-minute video (in 2 parts) that was presented to business leaders in CNN International. The author of Do You QuantumThink? New Thinking That Will Rock Your World discusses the reason our thinking has been limited and how we can free ourselves from outdated ways of thinking toward real solutions that will work now in our changing world – for ourselves personally, professionally, and globally. In this Part 2 Dianne discusses how the “old world” Industrial Age view has influenced our thinking, and how the “new world view” of the Quantum Age can influence thinking. She tells how a leading IT company used QuantumThinking to bring about an extraordinary business result. This is worth thinking about : ) NOTE: The video takes about 15 seconds to begin. Dianne Collins has received 6 book awards for Do You QuantumThink? The book is considered a must-read cutting-edge “classic” for our modern times. Dianne Collins joins Barnet and Freeman to share her powerful perspective on quantum reality. Dianne is the author of “Do You Quantum Think?” This is truly a thought provoking discussion. Rupert answers a question about the necessity of having a teacher. There is been a few significant planetary shifts recently, that show a “deemphasizing” of Tamasic/protective/fearful energy, and a greater emphasis placed on enjoyment (Rajasic) and inspired themes (Sattwic). Last week there were 3 planets in Virgo, which is a Tamasic sign. Debilitated Venus, joined the sun and (Tamasic) Rahu. As I reported last week, this created quite a lot of irrational fear, on the world stage at least, related to the Ebola virus, etc. Of course, each of us probably experienced some version of this “crisis of irrational fear” in a certain area of our life (whichever house where we find the sign Virgo most likely). In addition to that, Mars was in Scorpio, a Tamasic planet in a Tamasic sign. This placement referred to a healthy, empowered response to stress and fear. Hopefully, there was a part of you courageously aligned with strengthening your irrational fears and vulnerabilities. Since then, both Venus and the sun have moved into Rajasic Libra, bringing more of a focus on personal relating, happiness and creativity. Also, Mars has left Tamasic Scorpio, and entered Sattwic Sagittarius, emphasizing hope, meaning and the bigger picture. Also, both Mercury and Venus are in their own signs – with Mercury in his sign of Virgo and Venus in its sign of Libra. Thus, the intelligence of life situations has drastically improved. Rather than being dominated by irrational fear, (Rahu joined debilitated Venus and the sun) there is more intelligence brought to the situation, as Rahu is also joined his ruler, and we are reflecting on recent fears and conclusions.